The most user-facing addition is probably Ribbons, a built-in quick launcher that works a lot like SwipePad. Swipe in from the left, right, bottom, or any number of other locations including the lockscreen and notification shade, and you'll open a customizable vertical list of app/function shortcuts. Setting it all up is a bit of a pain, but it's just as configurable as everything else in AOKP. The best part is that an app or shortcut can be bound to a longer swipe. For example: on my phone, I've set a short left swipe to open my media app Ribbon, and a long left swipe to go straight to the main Settings menu. See the above screenshot for Ribbons running on my unsupported RAZR M with a pre-milestone build. 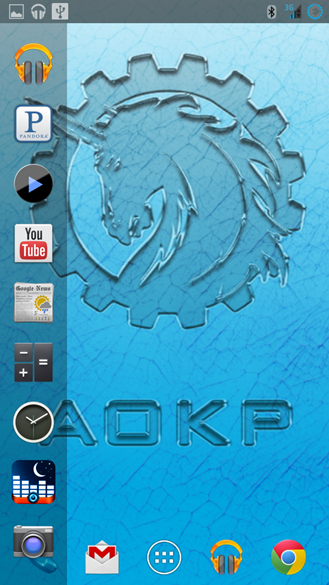 Builds are being sent to AOKP's servers as you read this, and all 44 official devices should be ready soon. Check the link below for new builds - at the time of writing, only the GSM and CDMA Galaxy Nexus have been posted. Those of you with unofficial devices should check your favorite ROM forums over the next week or so. Source: AOKP Blog - thanks, Michael Kennedy!